Can you believe it? Yet ANOTHER shameful incident involving u$c Football and their joke of an Athletic Department. The SCandals keep emerging from troy just like… you guessed it — a dozen clowns all piling out of a tiny clown car. This time it’s former trojan Running Back LenDale White, getting into an argument with Pat Haden on the sidelines of the $c-Colorado game on Saturday, and then being escorted out of the venue during the post-game press conference. Last week, while White was watching u$c’s Defense crumble and choke away a big lead against Arizona, he went on Twitter and criticized the Defensive Coordinator and his staff, and called for their termination, apparently in a profanity-laced rant. A week later, he’s on the trojan sideline, rooting on those same people he was ripping a week before. Allegedly, $c Athletic Director Pat Haden got into it with White on the sidelines, telling him he’s not welcome on the field with the team if he’s going to tear them a new one on Twitter during the road games. They had a heated confrontation, but White was not ejected at that point. It was AFTER the game, when Head Coach Steve Sarkisian was speaking at the post-game press conference, that White was accosted by security. Reportedly, he wanted to enter the Presser, but he was not permitted to the Press Room. When he became agitated over the slight, Security guards escorted White off the premises. White claims that Haden had him ejected, but Haden denies this. White went back on Twitter after being tossed, and called Haden a “coward,” and also said that for the first time ever, he was “truly embarrassed to b a trojan.” Now this is the first smart thing this guy has ever said… except he should have been embarrassed to be a trojan a long time ago, when his team was caught cheating, and forced to vacate all their ill-gotten victories. White epitomizes the “entitled” trojan attitude. He Tweeted that “he has done too much [for u$c] to be treated this way.” He couldn’t believe that Haden would shake his hand one minute, then have him removed from the stadium a little later. Haden insists that he never saw White after the game, and gave no instructions whatsoever to have White expelled. So if Pat is telling the truth (which is a huge stretch), then who had the balls to tell White he had to leave? Some rent-a-cops? Please. That’s like an equipment boy deflated balls against Oregon, on his own initiative. Obviously, the orders came from higher up, but Haden doesn’t want to admit it. If this is true, then White is absolutely right in calling Haden a coward. So let’s recount the recent events that have occurred at Circus City: A player pretends to be a child-saving hero when really he was evading Police on a domestic violence/robbery charge; Haden gets fined for personally confronting the refs on the field during a game; They lose to unranked Boston College; Another player sues the school and former Coach for forcing him to play while sick and concussed, causing brain damage, and then revoking his scholarship; Yet another player says that he and his Black teammates are treated like Slaves and that Coach Sarkisian is a Racist; They blow a huge, late lead at home against ASU, and lose on a last-second Hail Mary where all the trojans stand there are watch the catch being made; Another player gets erased from the roster and gets arrested for beating up his girlfriend; And finally this LenDale White/Pat Haden feud, resulting in his removal from the Coliseum and his subsequent verbal abuse of Haden on social media, and his embarrassment for being a trojan. “Trojan for Life?” Yeah, right. All of the above in just a couple of months. Not just LenDale White, but EVERYONE associated with u$c should be embarrassed to be a trojan. Meanwhile, Bruins really are Bruins for Life, and they have so much of which to be proud. 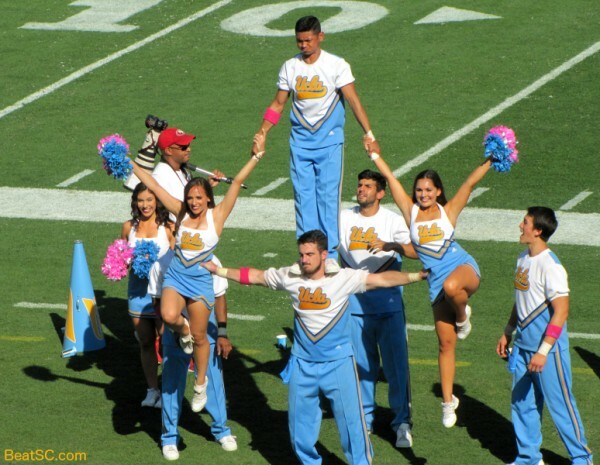 Not the least of which is the UCLA Spirit Squad. Here, as promised, are another 39 brand new UCLA Cheerleader photos, with all 22 female members of the squad represented (and labelled). "KICKED OUT!" was published on October 20th, 2014 and is listed in News from the Dark Side, UCLA/usc/Cheerleader Photos. Here’s to the “Trojan Family” as they like to say at sc. How about that mamma Kiffin worried that harm could come to her son when Alabama goes to play The Vols this weekend… they all deserve one another. GO BRUINS! BEAT THE BUFFS!